Alpha lipoic acid, a water and fat soluble vitamin-like compound with antioxidant and antioxidant recycling properties, is produced in small amounts in the mitochondria of bodily cells. Not to be confused with omega-3 alpha linoleic acid, alpha lipoic acid (ALA) is a necessary coenzyme for the Krebs cycle, the sequence of chemical reactions by which all living cells produce energy. Thanks to its water and fat soluble qualities, ALA is widely known as a potent and effective metabolic antioxidant that is easily absorbed and transported into organs and bodily systems, where it offers free radical protection both inside and outside of cell structures. As an antioxidant recycler, ALA interacts in a complex process to reactivate other important antioxidants, including vitamins C and E, glutathione and CoQ10, thereby boosting the body’s ability to counteract free radicals. In the U.S., the majority of ALA’s therapeutic benefits are seen to arise from its role as a powerful antioxidant, supporting healthy aging and organ function, as well as liver, cardiovascular, brain, skin and nervous system health. However, in Europe, ALA is used to treat and prevent complications associated with diabetes, such as diabetic retinopathy and symptoms of pain and numbness associated with peripheral neuropathy. As the development of cataracts is causally linked to oxidative damage in the lens, scientists continue to study the potential therapeutic use of ALA in preventing cataracts and the downstream cataract-related visual degeneration. Researchers have noted that ALA increases levels of glutathione, vitamins C and E and certain protective enzymes in the lens. This allows the body to more effectively scavenge and eliminate free radicals and reactive oxygen species, thereby supporting optimal visual health. In clinical trials, researchers found a statistical correlation between insulin sensitivity and individual markers of inflammation and oxidative stress. While large clinical trials support the role of ALA in treating neuropathy, research also suggests that ALA may help improve insulin sensitivity, lower blood sugar, reduce blood lipids and improve blood vessel tone, largely due to its antioxidant capacity to reduce oxidative stress and inflammation. Other studies have shown that ALA can enhance glucose uptake in insulin sensitive and insulin-resistant muscle tissue. Individuals with diabetes should check with their healthcare provider before taking ALA and should carefully monitor their blood glucose levels, particularly if insulin is required. In addition to its role as an effective antioxidant, ALA demonstrates a wide array of unique properties. ALA is able to cross the blood brain barrier to reach all parts of a nerve cell, thereby promoting healthy nerve function and preventing free radical damage to the neurological system. As well, ALA works synergistically with B complex vitamins to support energy production by helping to convert dietary macronutrients into stored energy for future use. By protecting the mitochondria from free radical damage, ALA helps to ensure that the body’s energy production remains efficient. Along with glutathione, multifunctional ALA may help protect the body against toxic metal contaminants found in the environment and food supply. By chelating toxic agents such as arsenic, cadmium, lead and mercury, ALA renders them inactive so they can be eliminated by the body. Small levels of alpha lipoic acid can be found in foods such as organ meats, red meats and brewer’s yeast, as well as cruciferous and root vegetables. Normally synthesized in tiny amounts, the extent to which the body is able to produce ALA declines with aging. Numerous scientific studies have found that supplementation can provide substantial therapeutic benefits to complement a healthy lifestyle. While the body does produce ALA naturally, levels can be increased with suitable dietary choices, as well as proper supplementation. Alpha Lipoic Acid 600 mg by Pure Encapsulations®: This gluten free, Non-GMO, hypoallergenic vegan formulation provides water and lipid soluble alpha lipoic acid in support of healthy glucose metabolism and nerve health. Alpha Lipoic Acid Time Release 600 mg by Natrol®: This time release formula provides 600 mg of ALA per serving in support of whole body cell rejuvenation, as well as antioxidant and cellular anti-aging protection. Also available in a 300 mg formulation. Free of milk, eggs, shellfish, tree nuts, peanuts, wheat, soy, yeast, sugar, preservatives and artificial flavors. Vegetarian formulation. 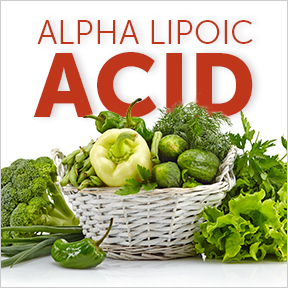 Alpha Lipoic Acid by Now® Foods: This synergistic formula provides 100 mg of ALA blended with complementary antioxidant vitamins C and E for potent antioxidant protection. Free of gluten, wheat, yeast, corn, milk and eggs. Vegetarian formulation. This entry was posted in Home and tagged Alpha Lipoic Acid 600 mg by Pure Encapsulations, Alpha Lipoic Acid by Now Foods, Alpha Lipoic Acid Time Release 600 mg by Natrol, ALPHA LIPOIC ACID. https://diabetesaction.org/article-alpha-lipoic-acid Uptake, Alpha-lipoic acid-, recycling, The Valuable Role of Alpha Lipoic Acid. Bookmark the permalink.